When Town and Country closes for the night at 8 p.m., most of Palo Alto begins to settle down for the day to come. 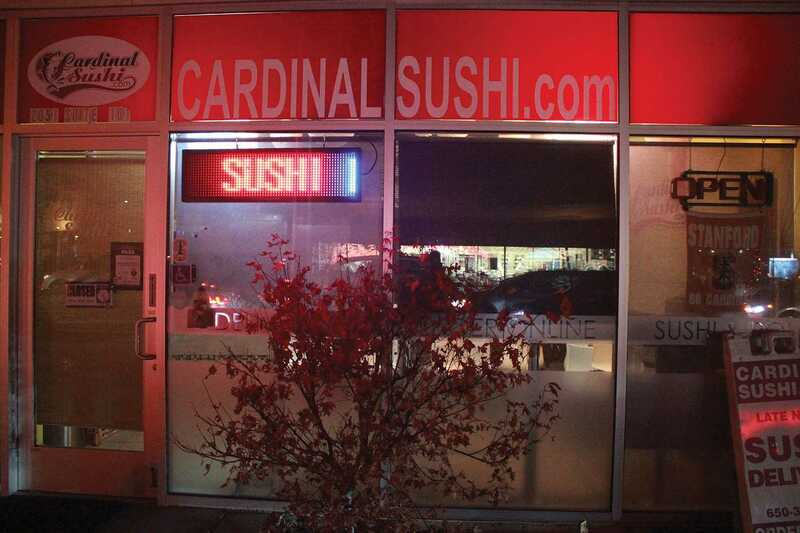 However, Cardinal Sushi, a small nook on El Camino Real, provides a well heated, fun spot for Stanford students and local residents who choose to burn the midnight oil. The subtle whisper of Top 40 Hits hisses from an outdated radio as groups of weary late night travelers huddle in the bright yellow confines of the sanctuary open till 1:30am. Verde visited Cardinal Sushi to learn about the lives of local night owls. Among these late diners are Abby Barker and Emily Jantz, both juniors studying at Stanford University. The duo sported grey onesies, and had caught a ride to the well heated diner to enjoy time out on the town away from the frigid, cold night air. They planned to call an Uber to get back to their dorm at the end of their late-night excursion. Although Jantz and Barker are full time students, they have struggled in the past to make it to bed at a reasonable hour. “We have a deal this year where whenever we stay up so late that we see the sunrise, we have to eat anchovies. We have this plan as an incentive to not stay up so late because we were really bad at getting enough sleep last year and we have morning classes this year,” Jantz says. Another pair of diners sits on the high chairs facing the empty streets of El Camino while slurping Miso soup and picking at their California Rolls. Both students at Stanford, Melanie Martel and Armando Banuelos are celebrating their second anniversary. Martel and Banuelos are studying to go to medical school and to learn computer science, respectively, and after a late night of studying often come to Cardinal Sushi to regain some energy. For the busy couple, sushi has been a great way to relieve some of the stress. “Everything we are doing [for our studies] is very time intensive and project based, so you really don’t have time to sleep, and you get hungry when you are doing work,” Banuelos says. Cardinal Sushi has become the couple’s late night tradition.